A few weeks ago, I added a "listening station" to our tot school room. 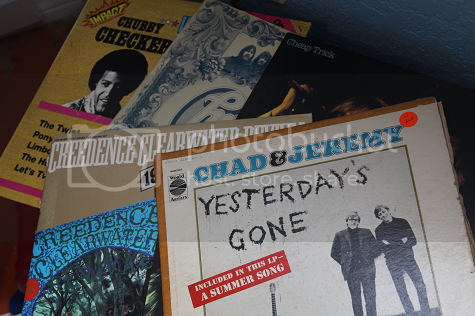 I had the idea to set out an array of vinyl records by artists beginning with that week's letter for Ethan to choose to listen to. This week, of course, was C. It was my first week doing this and a little bit of an epic failure because one of my favorite artists, Iron & Wine, released a new album that I had gotten on vinyl and proceeded to listen to every waking moment. Ethan is apparently a huge fan of the new Iron & Wine, too, which meant he had no arguments with listening to it on repeat constantly rather than suffering through some of the other records that I found in the closet by "C" artists. I think it will end up being a fun addition to our classroom, though. 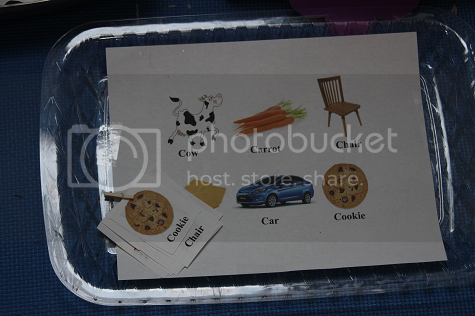 This week, a lot of the trays were picture matching. 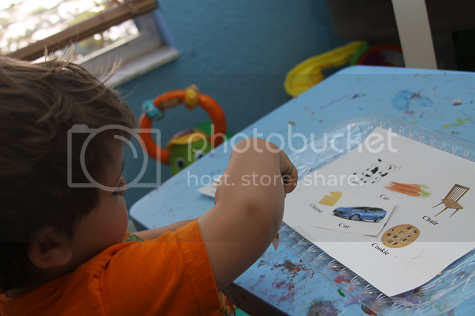 Ethan has really gotten into matching games for some strange reason so while I initially felt silly for so many redundant trays, he ended up really enjoying them. 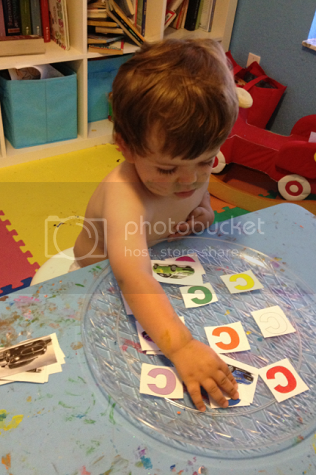 The matching game with the "C" items was his favorite -- he asked to do it several times each day. 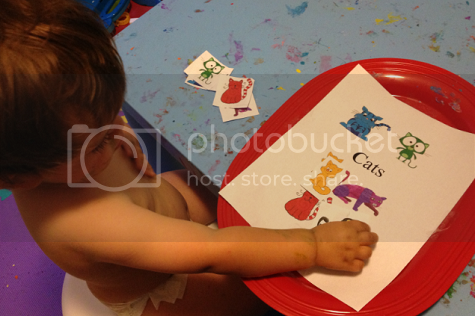 Since he loves cats, I made a cat and color matching game where the goal was to match each cat by color. 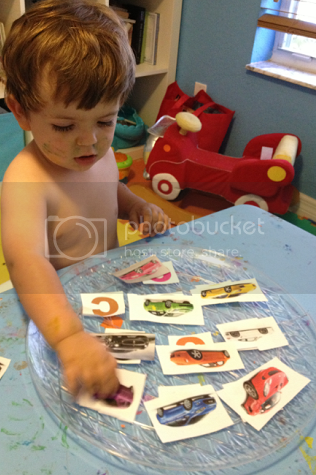 I also made a matching game with cars. 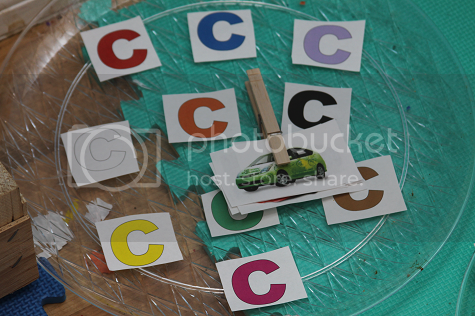 The goal was to match each colored car to the similarly colored letter "C." Ethan absolutely loved this game and pointing out the colors of each car. 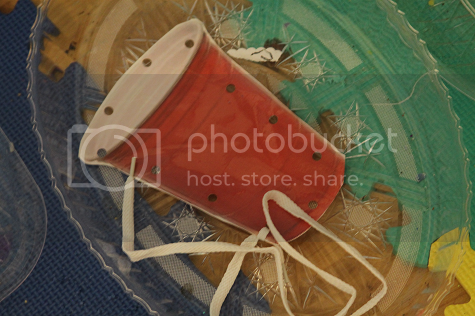 I had made a cup stringing activity that ended up being a total flop. Ethan got that cup began with the letter C, but that was the extent of his interest with this activity. He absolutely refused to pay any attention to this activity, which was weird because even though we haven't done stringing in a while, he used to really enjoy it. I was surprised at how much he loved the letter C sensory bin mostly because it was just a mish-mosh of random things I dug up at the dollar store. 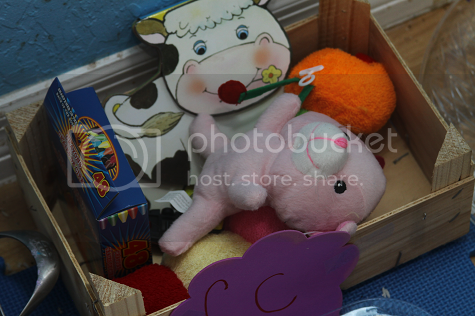 I had found a cow book, a box of crayons, a caterpillar, cars, a cat and some letter C flashcards. 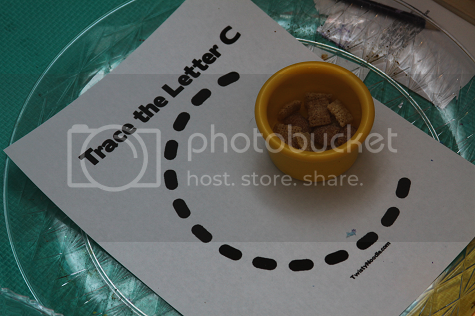 The final tot tray of the week was a make the letter C activity that I made using a dotted-line letter C print-out from Twisty Noodle and a cup of Chex cereal. Ethan helped me point out the letter C on the Chex box and then he had fun putting the pieces of Chex cereal onto the dotted lines. 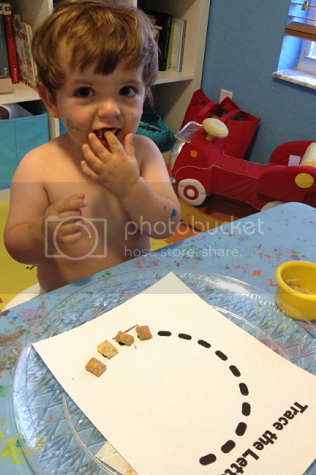 It was a nice idea in theory until he remembered that he loved Chex cereal and, well, I'm not sure the C ever got fully filled -- but his tummy did. 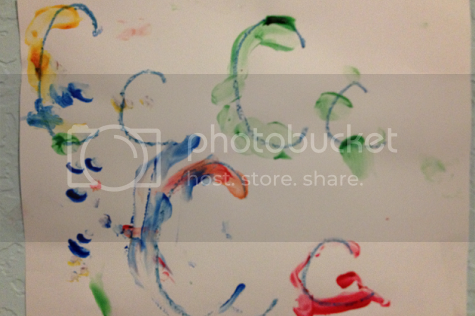 We had a lot of great art projects and activities for C week. 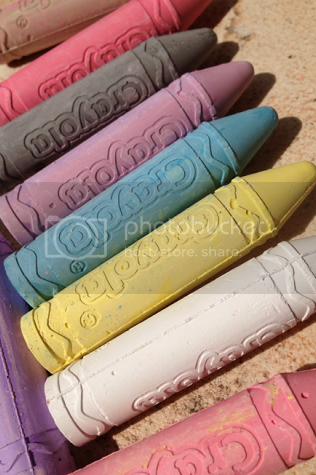 We spent a lot of time coloring with chalk. Ethan had asked to go to Grandma's house to color with his chalk, so we did just that. 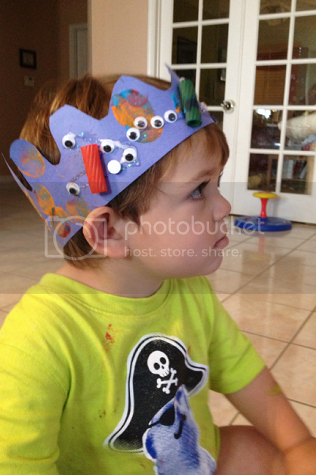 Ethan also had fun decorating a crown. I had cut out the "crown shape" from construction paper earlier in the week. 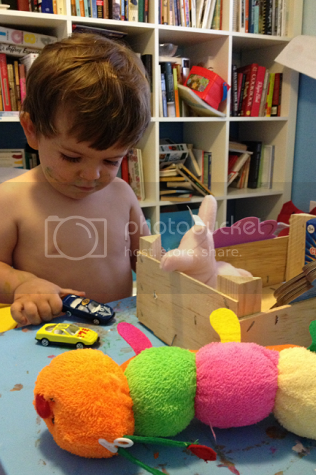 One afternoon after his nap, Ethan selected which art supplies he'd like to use. 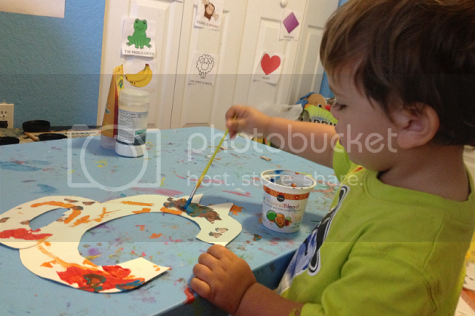 Naturally, he chose dyed macaroni, googly eyes and paint! 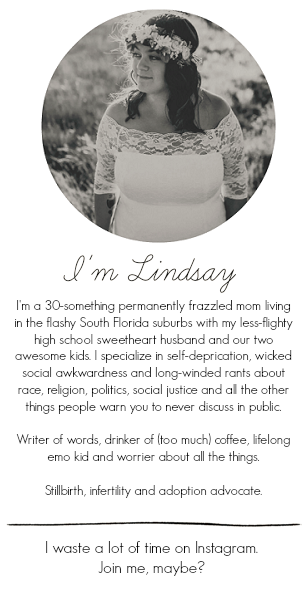 It ended up turning out super cute! Ethan loves to go to the beach and make sand castles. I thought it would be fun to make a castle at home. 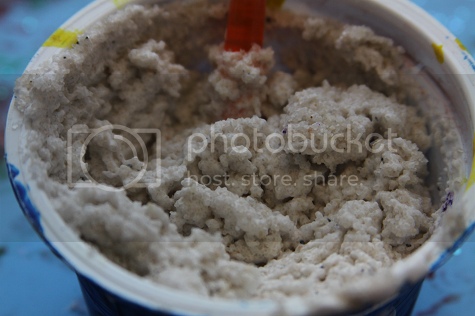 We mixed some play sand with some shaving cream and a little bit of glue. 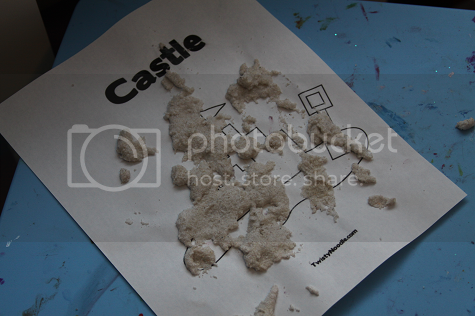 I printed out a sand castle print-out from Twisty Noodle. Ethan helped me squirt some glue on the paper for extra hold and then got to work painting with the sand to make a castle of his own. 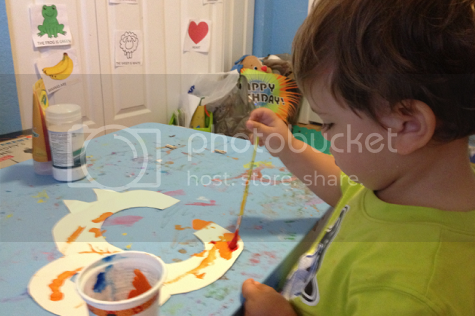 He ended up using his hands along with the brushes because it just felt so cool, so it ended up being a really great sensory project. It took about 24 hours, but the sand/glue/shaving cream mixture ended up drying well. I did place a laminating sheet over the final project to keep any stray sand from falling out and it looked great once completed! We painted a lot of fabulous TwistyNoodle print-outs this week: several of cats and some of the letter C. I love their free printables very much -- they make a great spur of the moment art project! My favorite art project Ethan did this week was the letter C cat. I cut out a large letter C and a smaller letter C from a heavy cardstock-type white paper along with two pointy ears. I assembled the cat so the smaller C was the tail and then cut out some whiskers and two tiny little C's (for the inner ear!) from pink construction paper. I did all of this while Ethan was napping and when he woke up, he had a cute cat ready to decorate! He loved painting this activity and laughed the entire time, insisting he was painting "Ethan's kitties" (even though they're all different colors and none are orange like he chose!). When the cat was dry, he helped me glue on two eyes and the pink construction paper parts I had made earlier. 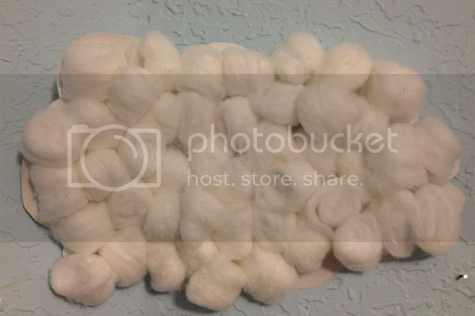 We also made a cotton cloud, mostly because Ethan has a new love for gluing. He glued the entire thing himself and did a surprisingly great job on squeezing the glue out correctly. 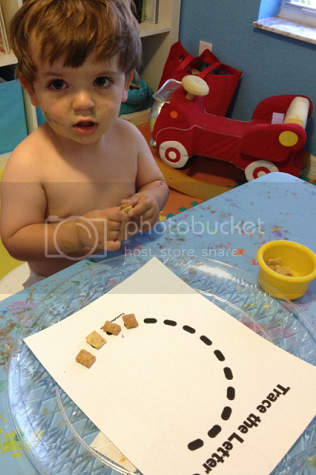 On a whim, I had drawn some C's on a piece of paper and given Ethan some fingerpaint to trace the C's that I drew. 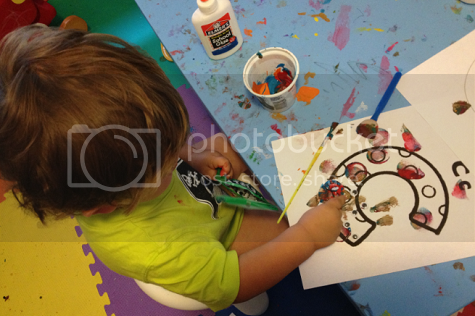 He mostly traced the C's but also painted all over the paper when he was finished. 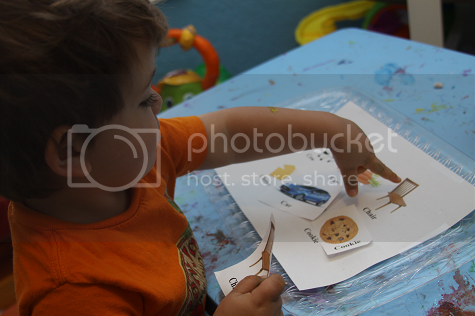 It was still a fun activity that I think we might continue for the rest of the letters, toddler willing. 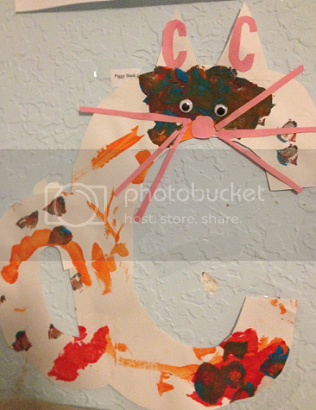 Because he had so much fun with our C cat craft, Ethan had asked to paint more cats. Lately he's been really into painting things and then describing to me what he painted, which is hands-down one of my favorite parenting "highlights" so far. I absolutely love when he paints something and then tells me what's on the paper, especially when it's something we did together earlier or a fun memory he had from a past activity. 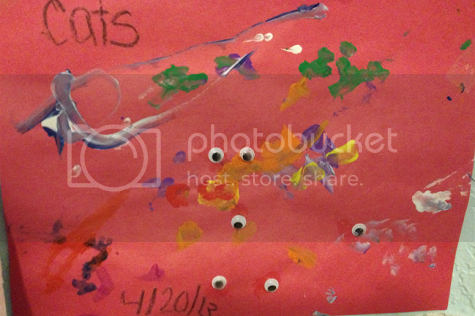 In this case, he painted cats and then asked for "eyes" to put onto the cats faces. So super sweet. 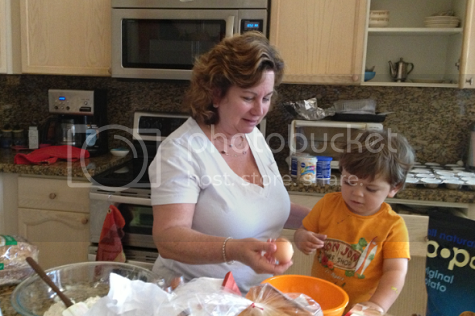 Of course, what "C" week could be complete without baking some cupcakes with Grandma?! Looks like fun! 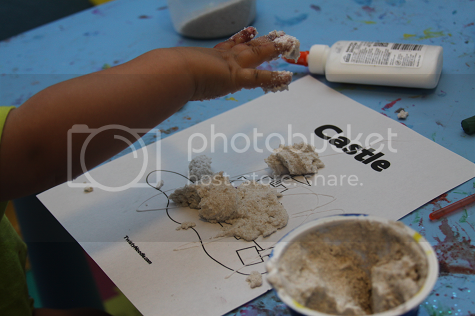 The sand castle painting idea is super cute. I love your Tot School! I wish I had done this with my first daughter. You have inspired me to start this with my second daughter when she is old enough. I love the matching of the C's and cars by color, and the cat matching, and the letter C cat! I really have to get back into doing this sort of thing with Simon! All your tot school ideas really make me want to be a stay at home mom...*sigh* It is so hard when you know you can't stay at home.